Join us on April 2 to support your local TeamMates chapter! It’s that time of year again— Runza Day! 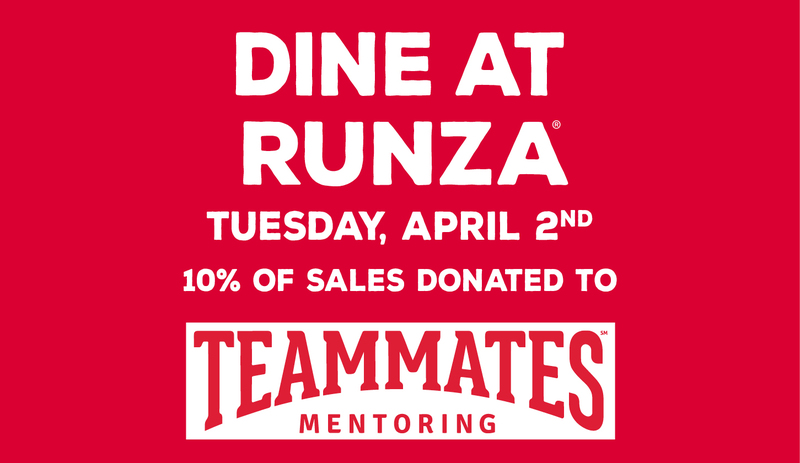 We are so thankful for Runza supporting our communities by donating 10% of sales on April 2 to local TeamMates chapters. Though not all of our communities have Runza and can benefit from the fundraiser, this model is a great to replicate with your local restaurants or businesses. If you have any questions on how to do that, please contact Hannah Miller. Runza Day is April 2nd. On that day, make sure to have representatives from your chapter at your assigned Runza during lunch and dinner hours. Many chapters have board members or mentors there all day! Take time to go around and thank customers for dining at Runza, as well as supporting your chapter. This is an excellent opportunity to pass out brochures and spread the TeamMates message! Store List- Your store’s contact info will be listed. Please call your manager by March 12. Timeline- Please check this every week! Email graphic to be used April 2. If you have any questions, please contact Hannah Miller.